PURPOSE & CONVICTION: A clear sense of purpose and the conviction that their work contributes to having a meaningful life. PASSION FOR MISSION: A genuine passion, commitment, and knowledge for the fundraising purpose. RAPPORT UNIVERSALITY: The skill to establish genuine rapport rapidly with just about anyone. RELATIONSHIP DIVERSITY: The ability to create and sustain meaningful long-term relationships with people who have a wide range of personality types and diverse cultural backgrounds. AUTHENTIC ENGAGEMENT: Actively listens with interest and open mind, and be nonjudgmental and authentically care about others. INTELLECTUAL PURSUIT: Has intellectual curiosity, engages in disciplined learning, and rapidly integrates knowledge. LEADERSHIP: Routinely demonstrate excellence as a leader, collaborator and team builder. INSPIRES AND MOTIVATES: Has exceptional communication skills with the ability to inspire and motivate through both logic and emotion. ASKS WITH PLEASURE: Embodies confidence, comfort and true pleasure in skillfully asking for gifts of all sizes and types. EXECUTES: Executes on the deep understanding of institutional priorities and giving vehicles¸ and has the discipline to create and implement cultivation and solicitation strategies. ETHICAL: Exhibits total respect and commitment to ethical philanthropy professional practices and conduct. SELF-DRIVEN: Radiates immense energy, self-motivation, and dedication to goal achievement. EMOTIONAL INTELLIGENCE: Acts upon high emotional and social intelligence. POSITIVE: Has a sincere and positive attitude and routinely sees possibilities and expresses optimism. FOLLOW THROUGH: Consistently follows through in all endeavors. An MGO takes responsibility and closes the loops. 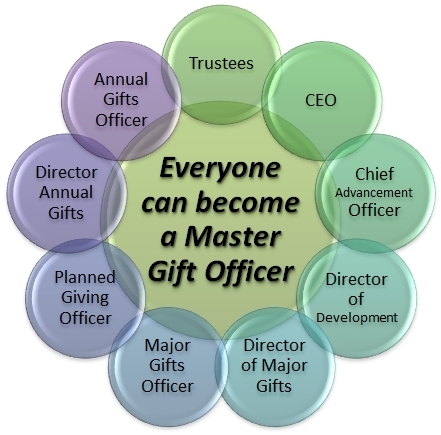 ©2011 Diane Blumenson, Philanthropy Leadership Advancement Nexus & Copley Raff Inc.